On Wed, Jul 23 WYD pilgrim groups with Marist connections were invited to historic Villa Maria, Hunters Hill, Sydney, to mark the anniversary of the 'Fourviere pledge'. 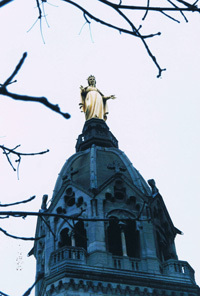 On Jul 23, 1816 twelve young men gathered by the shrine of Our Lady at Fourviere, Lyon, France, and promised to form the Society of Mary. All Marist branches honour this event as a foundational moment. 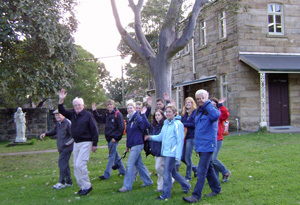 Fr Tony King SM (left) escorts Fr Herman Woeste SM and German WYD pilgrims on a tour of historic Villa Maria, Hunters Hill, NSW. Bougainvillean Marist, Fr Austin Magara, leads the dance during the Fourviere celebrations. 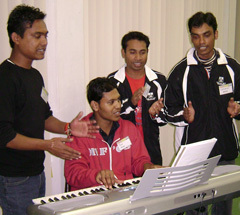 Bangladeshi pilgrims hosted by the Australian Province entertain on Fourviere evening. 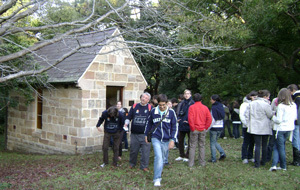 Students and staff from Marist schools in France visit St Peter Chanel chapel in the grounds of Villa Maria. Fr Pascal Boidin SM with French pilgrims. Australian Marist Provincial, Fr Paul Cooney, (left) with some of the Fourviere guests. Twenty countries were represented (Australia, Bangladesh, Belgium, Bougainville, Cambodia, England, Fiji, France, Germany, Japan, Malaysia, Mexico, Myanmar, New Zealand, Norway, Philippines, Singapore, Tanzania, Thailand & Vietnam). with Australian Fr Tony Kennedy SM. 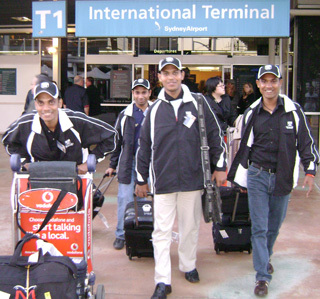 Four former students of Don Bosco Students' Home, Dhaka City, were amongst the first pilgrims to arrive in Sydney for World Youth Day. 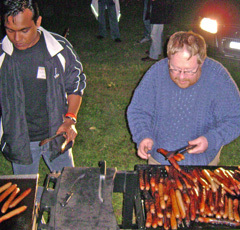 They were invited to the event by the Marist Fathers' Australian Province. They are Shourov Ghosh, Bivash Rozario, Shaiket Biswas and Uzzal Costa. Bivash and Uzzal attended Green WYD in Victoria prior to WYD, while Shourov and Shaiket participated in the Marist International Festival at Mittagong and Hunters Hill before the main activities of WYD week. 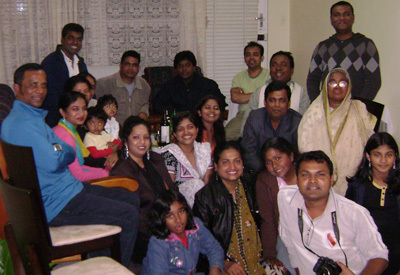 Catholic Bangladeshi families (below) in the Rockdale/Bexley area provided welcome and accommodation for the four young men. 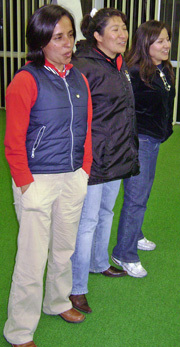 The lads' arrival in early July. 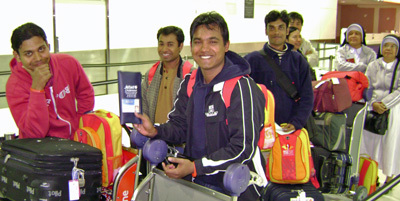 The four pilgrims returning to Bangladeshi on Aug 11. Young People for Development (YPD) is a network of youth from nations mostly of South and South-East Asia who are enthusiastic about development in their own countries. YPD collaborated with Marist Training Resources for their annual assembly in WYD week as well as skills training in the week following WYD (see below, 'Ready for Action!'). 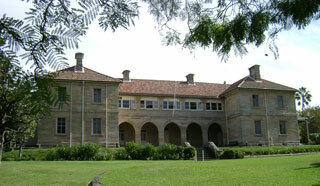 Both events used facilities of the Marist Fathers at Hunters Hill, Sydney. 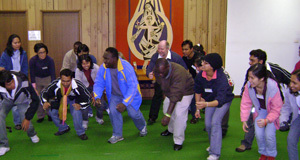 This event preceded WYD and began in Melburne on Jul 05, culminating with an eco-journey to Sydney and WYD. This post-WYD training happened on Jul 22-24. Participants were drawn from numerous Asian countries and focused on leadership, teamwork and management skills as well as the 'see, judge and act' vision of the late Cardinal Joseph Cardijn. During WYD week in the beautiful setting of St Patrick's, Church Hill, the Marists offered a place for prayerful adoration, reconciliation and teaching based on the Marist spirit and mission. St Patrick's church is located in Grosvenor St, Sydney, in Sydney's historic 'Rocks' area. It is accessed from George St and not far from Wynard Railway Station and Circular Quay. In the crypt and courtyard areas there was opportunity to venerate of relics of St Peter Chanel and St Marcellin Champagnat -- and to visit the 'Marist tent' (see below). St Peter Chanel, a pioneer Marist priest and missionary in the Pacific, was martyred on the island of Futuna in 1841. He has since become one of Australia's patron saints. Fr Chanel's remains were transferred to Europe in 1859 making him the only canonised Saint to date who has rested on Australian soil. A relic was displayed in the devotional area of the crypt beneath St Patrick's church. The Blessed Sacrament was exposed in a monstrance belonging to St Marcellin Champagnat. There was also a relic of St Marcellin. A major relic of St Peter Chanel was venerated in the crypt of St Patrick's, Church Hill. 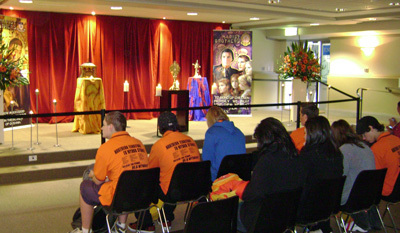 Using St Marcellin Champagnat's monstrance the Blessed Sacrament was exposed along with a relic of St Marcellin. 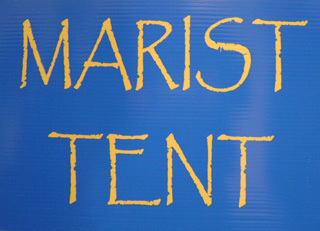 Br David Hall FMS, speaking on the Marian face of the Church with pilgrims in the Marist tent. At the Marist Expo site fold-up maps were available for pilgrims wishing to visit the Marist site at nearby St Patrick's, Grosvenor St, Church Hill. 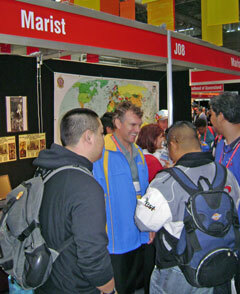 Distinctive blue and gold jackets made Marist religious and volunteers easy to spot at St Patrick's and at the Vocations Expo. Translations of the life of St Peter Chanel included English, Spanish, French, Portuguese, Thai, Bengali, Korean and Vietnamese. Pilgrims from St Paul's parish, West Sunshine, Vic, pause outside the crypt with Bougainvillean Marist seminarians Raymond Girana and Glenford Momis. 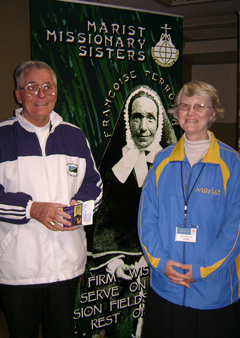 Archbishop Adrian Smith SM (Honiara, Solomon Islands) with Sr Anne Baxter SMSM near the banner of Marist Misisonary Sisters foundress, Francoise Perroton. Fr Steve Chobo, Tabora diocese, Tanzania, with Burmese pilgrim Kyi Thar (Marist Mission Ranong, Thailand), SMSM aspirant, Leonida (Philippines) and Fr Kevin Medilo SM, (Marist Mission, Thailand). Vicar Provincial of the Marist Fathers' Australian Province, Fr Bob Barber, with Marist pilgrims from Davao, Philippines. in the ante-chamber of St Patrick's crypt. 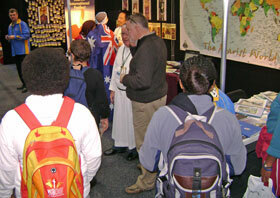 The Darling Harbour Vocations Expo included a section staffed by Marist Sisters, Missionary Sisters, Laity, Brothers and Priests. 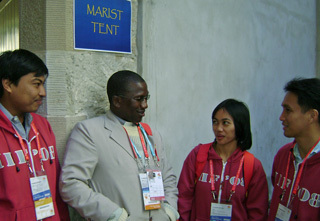 They were available during the weekdays (Tue-Fri) of WYD week to consult on any aspect of Marist life. 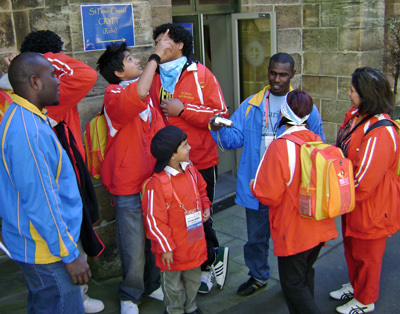 WYD activities amongst members of the Marist family were coordinated by a working group of Marist brothers, sisters, priests and laity. 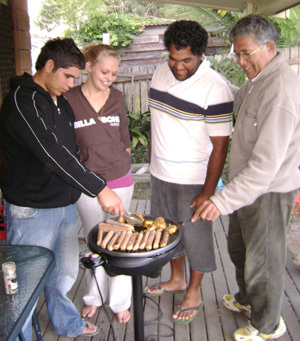 From the Macksville-based ministry team amongst indigenous people of NSW's northern rivers Marists were involved in WYD plans. 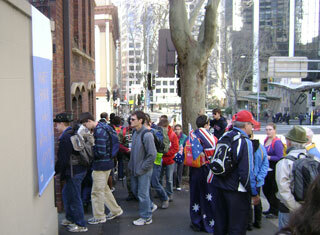 Several indigenous young people from the Bowraville-Macksville area were in Sydney for WYD 2008. 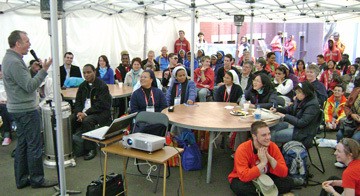 WYD pilgrims at Bowraville, NSW. 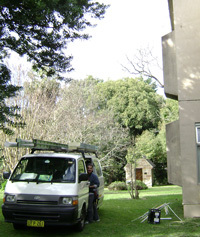 Villa Maria monastery, Hunters Hill, Sydney, is now equipped with the latest in high speed Internet technology. The historic monastery building was for over a century a hub for missionaries travelling to and from the Marist Pacific missions. Today Villa Maria is increasingly used for international gatherings of Marists -- and visitors can now benefit from the latest in wireless broadband technology.